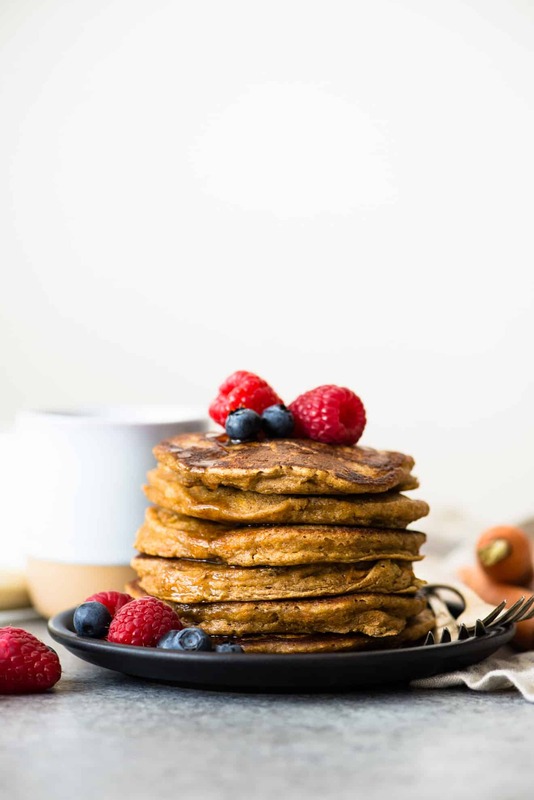 Sneak in more vegetables with these healthy oat flour pancakes! 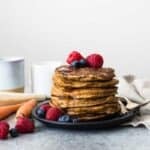 You can make several batches of pancakes over the weekend and freeze or refrigerate them for eating throughout the week. The first time I made pancakes for my husband, he asked me for some lemons and powdered sugar to serve. “Huh? What are you going to do with those things?” I asked. “Sprinkle sugar on the pancakes and squeeze some lemon juice over it,” he replied. Considering that I only eat my pancakes with maple syrup, I was perplexed by his request. It wasn’t until I started spending some time in England that I realized eating pancakes with lemon juice and powdered sugar is a thing over there. Perhaps it’s something that people do in America as well but I just haven’t noticed. Have you ever heard of eating pancakes with lemons and powdered sugar? I don’t usually eat things that are too sweet in the morning, so I just eat pancakes plain with a bit of peanut butter and fresh fruits. That’s why I added a lot of spices to the pancakes to make them tasty on their own. I think you’ll enjoy all the flavors of the spices that are going on, too! However, if you don’t have nutmeg or cardamom around the house, feel free to leave those spices out. 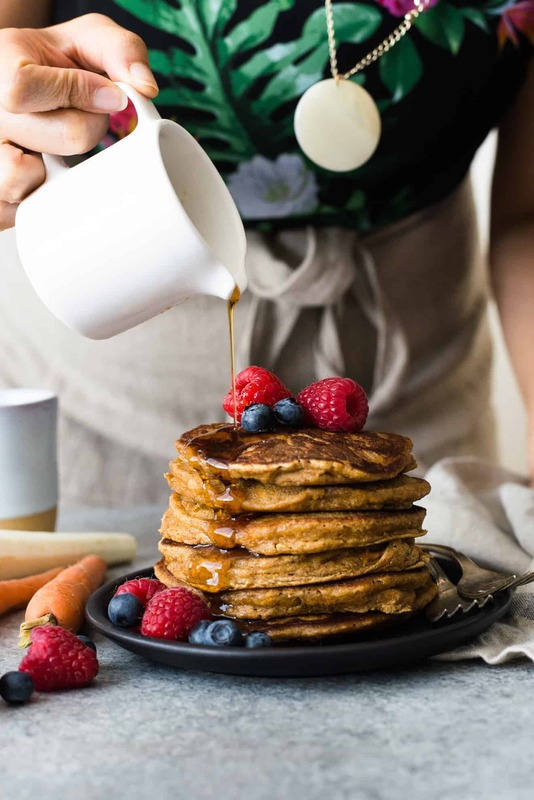 Using the right amount of vegetables: The first time I tried making these pancakes, I mixed in 1 cup of grated carrots and 1 cup of parsnips. I used far too much vegetables. The pancakes turned out soggy and they weren’t appetizing to look or eat. I think using a total of 1 cup of grated vegetables is the perfect amount for this recipe. If you happen to go a little over (say, by adding 1 1/4 cups of grated carrots and parsnips to the batter), they should still come out fine. Substitutions: (1) These pancakes work great with 1 cup of grated zucchini, too. (2) If you’re not on a gluten-free diet, you can use whole wheat or all-purpose flour for the pancakes. A one-to-one substitution will work. (3) I used maple syrup to sweeten the pancake batter, but any other kind of sweetener (such as brown sugar, regular sugar or honey) works, too. In a large bowl, mix the oat flour, cinnamon, ginger, nutmeg, cardamom, baking powder, baking soda and salt together. Stir in the milk, eggs and maple syrup until the batter is well incorporated. Let the batter rest for 10 minutes. I usually grate my the carrot and parsnip during this time. Gently fold in the grated carrots and parsnips. Heat a large non-stick skillet with 1 to 1/2 tablespoons coconut oil over medium heat. Add the pancake batter, about 1/4 cup at a time, and use a spatula to smooth out the batter into a circle. I usually fit about 3 pancakes on my skillet. Cook for 2 to 3 minutes, until the edges of the pancake is puffed up and bubbles have formed on the pancake batter. Flip and cook for another 2 minutes or so. Dish up the pancakes and serve with maple syrup and fresh berries, if you like. I typically peel the skin from a carrot and parsnip before grating them. Carrot skin can be quite tender, so you can leave the skin on if you prefer. You’ll probably use a small carrot and a small parsnip for the recipe. If you have any extra bits leftover, just dice and toss them into a stir fry. Thanks, Erin!! You know, the funny thing is, even after all these years, I don’t think I’ve even tried it yet! I just instinctively reach for the maple syrup! !